Let our new battery powered, wifi controlled uplights transform your event hall into a visually stunning space!! Looking for a DJ or band for your event? Top Tier Entertainment is a full service entertainment company based in Montgomery, Alabama specializing in D.J., live music and audio solutions. 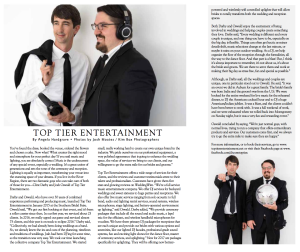 Top Tier Entertainment specializes in wedding ceremonies, wedding receptions, rehearsal dinners, engagement parties corporate events, mardi gras balls, Christmas parties and sorority or fraternity formals. Even with a life full of musical experience and the completion of two previous releases, it was a losing battle with addiction that left an emptiness only one true relationship could fill. Now, years later and newly restored through God’s power, grace and mercy, Clint finds new inspiration through sharing his story with others and using the gift of music to sing God’s praises on his new C.D. “God It’s You.”. Clint’s new E.P. is a collection of song’s that touch on personal powerlessness, faith, hope, love, and the certainty that God is still restoring lives through miracles. City of Montgomery – Dreams Start Here from LWT Connect on Vimeo. Musician Clint Darby loves Montgomery. Yes, it’s his hometown, but it’s also a place where, if he wanted, he could play guitar and sing his songs every night of the week for the rest of his life, always to a warm, welcoming, perpetually growing audience. Still, as much as he loves his town, for his musical future Darby is looking farther away from home. His new CD, “Farther Away from Home,” is a collection of acoustic-based, melodic rock songs with multiple guitar parts and arrangements. He’s hoping the CD reaches beyond this region so that more folks can hear him at his best — and, most importantly, on his own. Darby, 32, is probably best known as one half of the popular acoustic guitar/vocal duo Clint and Kip. A few years ago, he started writing and performing songs with fellow musician Kip Traylor, a local female vocalist and guitarist. Since then, they’ve played seemingly nonstop in Montgomery, released an EP and amassed a devoted group of local fans, breaking only to take their act on a couple of tours. On “Farther Away from Home,” however, it’s all Clint Darby. On the 10-song CD, he puts his skills as both vocalist and multi-instrumentalist to use, playing not only acoustic and electric guitar but also bass guitar, piano, keyboard, and some percussion instruments. He officially released the self-produced “Farther Away from Home” late last month at the downtown club Off the Wagon, performing for an enthusiastic crowd of around 100. If you’ve yet to see Darby perform, it’s not because he hasn’t been out there. Alone or with Traylor, he averages about 17-20 gigs a month — the June lineup totals 18 — mostly at local venues such as 1048, Nobles, Mellow Mushroom, Ruddles and, now, The Exchange at the Montgomery Renaissance Hotel & Spa at the Convention Center. As with many musicians, Darby’s a big presence online. You can not only buy his “Farther Away from Home” ($10), but also hear his songs, watch his videos and read his blogs on his Myspace page, www.myspace.com/clintdarby, or on his personal Web site, www.clintdarby.com .To those accustomed to hearing him as part of a group, listening to his solo work may take you by surprise. Even as he embarks further on his solo career (“Farther Away from Home” is his second CD, a follow-up to his 2005 self-titled EP), he’s still pairing up with Traylor for shows, often with a full band — Alvin Sawyer on bass guitar/vocals and Josh Oswald on percussion. But those shows are becoming fewer and far between for Darby. “I would certainly have to say that I’m more involved in pursuing personal and solo endeavors,” he said. The buzz is generating, and at this point, he said, more than half of his gigs are solo. Darby’s sound is reminiscent of the contemporary artists he’s drawn to, such as Mindy Smith and Nickel Creek. But you can also sense the impact of his big, earlier influences like Mississippi blues musician Albert King, jazz guitarist Wes Montgomery, and rock guitar virtuosos Eric Clapton and Jimi Hendrix. “I consider myself as a musician first,” Darby said, and that applies to songwriting as well as performing. The groundwork for songs, “almost seems to arrive subconsciously,” he said of writing music. It’s only after the musical framework is laid down that he works on lyrics, writing about relationships or uncertainties in life, for instance. Well, it’s the day you’ve been waiting for/don’t care about/dreading. It’s time to review the area club scene in 2005 as only yours truly is crazy enough to do it. Okay, there are probably trained monkeys that could do it as well, but work with me here. You’ll probably notice some surprises this year. You’ll also notice my opinions and those of people who wrote in don’t exactly agree. Disclaimer: This was only for local acts. For a while there, you couldn’t find a club in this town that didn’t have this duo perform there. There’s a reason for that. They’re good. They’ve also developed a very strong fanbase. Twenty-nine-year-old Clint Darby and 22-year-old Kip Traylor have recently busted out into the Auburn music scene. The two Montgomery natives met here in Auburn only a year ago. Darby had begun to make a name for himself, and adding female vocalist and guitarist Traylor into the mix has proven to be a musical dream. Darby and Traylor usually perform five nights a week in Montgomery and have recently brought their acoustic act to Auburn. The two perform originals influenced by artists such as Dave Matthews and The Beatles, and covers that range from Damien Rice to Kenny Wayne Sheppard. The duo has received regional recognition, which has landed them a regional tour throughout Alabama, Georgia and South Carolina beginning in October. The Corner caught up with the two during their weekly Thursday night performance at Wings to Go. Clint: I’ve been playing about 10 years. Kip: I’ve been playing about five years. Clint: I started playing guitar in high school and formed several bands throughout high school. Then when I got out of college I was in a big party band called The 2nd Coming. We were kind of doing the college circuit up here doing frats and sororities. I left that band to do acoustic. Kip: I played piano ever since I was real little and one day I just picked up the guitar. What made you want to learn to play? Clint: Listening to people like Eric Clapton and Jimi Hendrix, all the guitar greats. Kip: I had always wanted to learn and I kind of just picked it up and ended up teaching myself right at the end of high school, beginning of college. Do you remember the first song you learned to play? Kip: Mine was probably “Hang” by Matchbox 20, to be honest. Who writes your original music? Clint: Both of us actually. Anything we’re writing now together we’re putting both of our names on. If one of us writes the lyrics the other one is at least helping arrange the music. How would you describe your originals? Kip: With a strong rhythm and lead. Kip: Mine are Dave Matthews, Sarah McLachlan and John Mayer as far as lyrically. Clint: The Beatles certainly, and Eric Clapton and Jimi Hendrix. Newer stuff I’d have to say the new Oasis and Nickel Creek. Nickel Creek especially with my writing. Do you both play music full-time? Clint: Yep, we’re both full-time musicians. So, is this what you plan on doing for a long time? Clint: Yeah, we hope. I left teaching high school for four years. I don’t see myself ever going back. Kip: It’s the best job in the world. It’s not even a job. Like our friend Jeremy says, the job is setting up and breaking down. Clint: The music is the best part about it. I also like meeting people. We go on the road every couple months for a couple of weeks, touring has definitely become a big bonus for me because I love that. It’s kind of like a vacation. We play at night and go to the beach during the day. I read that you, Clint, have released a self-titled album. Are both of you planning on releasing an album together? Kip:We’re planning to release it within the next month. Clint: It can be found online at www.clintdarby.com. There is live music and media there, too. Kip: And of course the CDs will be sold at our shows. Kip: It changes. I really like playing “Give Me One Reason,” by Tracy Chapman. Clint: My two favorite originals right now to play is our newest song called “Nothing At All,” it’s not even tracked yet and “Paris,” you can find that one on the Web site. My favorite cover right now is probably “Ghost” by Howie Day. And I really like “Cannonball,” by Damien Rice. Clint: We play every Thursday at Wings to Go. We have some days at Touchdown’s, too. We play on an average about 15 to 20 gigs a month. We play a lot in Montgomery. Kip: We’re looking at playing some days at Snapper’s. And possibly Supper Club on a Sunday night. If you could perform with any band or musician, dead or alive, who would it be? Kip: I would love to play with Dave Matthews. Clint: I know this is kind of strange, but it would be wild. They’re not really a guitar-oriented band, but I think it would be fun to play with The Doors. So what are you listening to now? Kip: I just got really into Damien Rice lately. I really like the new Nickel Creek CD. Clint: Yeah, that’s what I was about to say, Damien Rice and Nickel Creek. Kip: I’ve also gotten really into Anna Nalick. Clint: To be a successful national act. Kip: We have a goal to reach it level by level. This year the voting at the Battle was especially tight, according to Richard Young, one of the event organizers. “It was very tough, especially in the rock/country/pop category because the bands were so diverse,” he said. Even those who didn’t leave the Battle of the Bands with a victory enjoyed the experience. Despite coming up just short, Clint Darby of Clint and Kip, had no regrets.